The Nazi’s had a racial philosophy in which the Germanic or Aryan Race was thought of as superior, and they were concerned with breeding the right type of people. Much lesser known it is, that Hitler’s contemporary Count Richard Coudenhove-Kalergi, who is now regarded as one of the founding fathers of the present European Union, had ideas somewhat similar to these, this time however with the Jews as a predestined, a spiritual leader race [Führerrasse]. Coudenhove-Kalergi, credits the Jews with most of the European civilizations philosophical and humanistic attainments, and literally states that: “Europe has been conquered religiously by Jews”. Europeans are described as slave people who damaged “the spiritual master race”, always jealous of the Jews. Then there is Coudenhove-Kalergi’s vision of the future population of Europe as “A Eurasian-Negroid race of the future, similar in its outward appearance to the Ancient Egyptians”, and his odd ideas about breeding. I think one could really laugh at a lot of Coudenhoven’s self-important scribblings, if it wasn’t because a lot of people in high and influential quarters seem to take it all rather seriously. Just 10 days ago on the 18th of April 2008, an event was held by the EU to honor Coudenhove-Kalergi. The grandson of the last Austrian Emperor Otto Von Habsburg (95), a long time disciple of Coudenhove-Kalergi presented Coudenhoven’s works. This was announced on a page from the European Commission (Europäische Kommission), in an article which did not say anything about the works of Coudenhove-Kalergi, but reported only superficially. (I will translate the short article into English before long) (Danish translation here http://blog.balder.org/?p=400 ). It would be quite interesting to know if Coudenhove-Kalergi’s book Practischer Idealismus (1925) was mentioned at the meeting. It usually is not, and is neither mentioned on pages from the European Union, nor on the pages of the Pan European Movement, which was founded by Coudenhove-Kalergi, and supported with money from the notorious bankers Rothschild and Warburg. In Germany this book is unofficially banned, though it is not on the official list of books censored by the German government, it is not possible to buy it in any bookstores in Germany, neither new nor used. Much of it sounds suspiciously similar to the development of the European Union today with the Lisbon Treaty as a decisive point of no return. And since Coudenhove-Kalergi is officially recognized by that same institution, I suppose one does not have to have a lot of fantasy to see a connection between Coudenhove-Kalergi’s philosemitic racism, and the strategies of the European Union. After the end of WWII, Nazism and Communism have slowly been replaced with this equally totalitarian utterly destructive and ugly philosophy. Here is the translation of the German article about the Coudenhoven-Kalergi meeting. 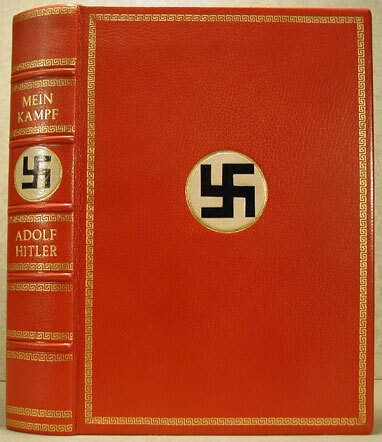 I own an English-language copy of Mein Kampf published in the 30s (can’t remember the exact date). It is annotated throughout with commentary that aims to disprove and discredit practically every statement. Interesting points Balder. Part of Kalergi’s activism on behalf of a ‘new-Egyptian’ race supplanting the Europeans might be attributed to his being himself a product of elite Nippo-Austrian miscegenation. Kalergi believed himself to be anticipating the future, much as Engels did when he said “Antisemitism is the socialism of fools.” These types knew that reactionary resistance to these programs was unfunded, disorganized, and essentially totally ignorant of the conspiracy. Balder is the only WN talking about Coudenhove-Kalergi on the Internet. Nobody else seems to care that C-K’s agenda is being implemented. Sarkozy has recently announced that miscegenation “metissage” is patriotic. http://galliawatch.blogspot.com/2008/12/mtissage-now-its-obligation.html Balder forgot to add that the only race in Europe that won’t be encouraged to mix are the Jews whom he announced had replaced the old European aristocracy with a new Talmudic “spiritual aristocracy.” Purebred Jews will be the “regulators” (bureaucratic managers) of the Egyptian colored global plantation. Coudenhove- Kalergi married Jewsesses exclusively. Unfortunately, he was the visionary not Hitler. According to the people implementing C-K’s agenda, what passes for a “purebred” Jew? Ignoring that there are Ashkenazis and Sephardics (as well as other, smaller groups of Jews, like Ethiopian and Chinese Jews), it always seemed to me as if Jews were mostly mongrels themselves. Sure, Judaism is based around eugenic principles and outbreeding/mixed marriages are usually frowned on, which could in a sense make the Jews a “race,” but I still wouldn’t call it a pure one. I was really moved into tears, my eyes got swollen and my heart pounding so fast as I read on the story of Holocaust in a discarded history textbook from US public school. After that emotional height, I wondered how Hitler could have so deeply hated the Jews and other “minorities” (so considered) during his time. Then I resolved to see his writing, the Mein Kampf, and yes, it was revealed to me by my reading and along the lines. His experiences forged the way towards the assertion, in his heart, mind and soul, that the Jews, for him, is fated to be exterminated on Earth. But now, I wonder why he had put the “fate” of the Jews, and “minorities” unto his own hands and into the German nation as a whole. On the other hand, this gave me the impression that “Social Darwinism” is only a myth, a dangerous myth that was not allowed to spontaneously occur, like the brutish, animalist nature, it was rationally accepted and put into action by such people whom power is entrusted, in order to nurture their penchant for power and psychotic luxury and entertainment. I asshme they will clear some space when we play, but they don’t. ending credits feature a dedication, “For Stanley. Kubrick’s usual lackadaisical pace would come back to haunt him this time. So the Jews want to censor it and add there own opinions. Then they will ask for some of the proceeds. No book should be centered but any group.